The ASP-Imus Chapter together with the PDAO of Imus City conducted a seminar on Understanding Autism and Opportunities for CWA. It was held last June 21, 2014 at the Bulwagang Ugnayan of Imus City Hall. 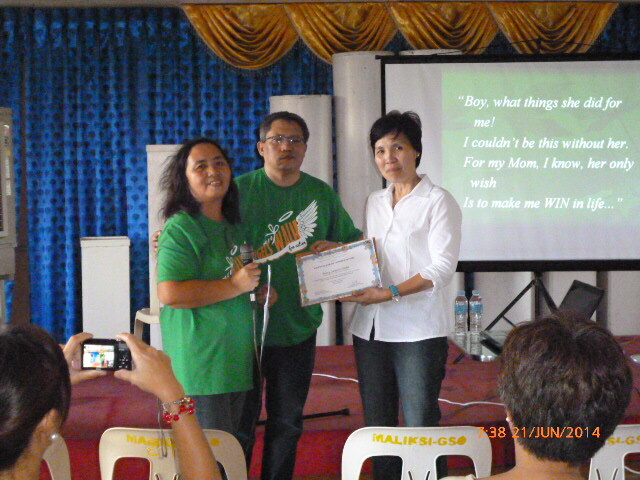 It was attended by 8 Sped teachers/therapists and 13 parents whose children are mostly below 10 years old. Ms. Jan Pena, the Resource Speaker and National President of ASP explained that Autism is not a disease but a life-long disability. She enumerates and discusses the different signs and characteristics of autism. It is a natural thing for parents, upon learning that their child has disability, not to accept their child's condition and to lose hope. But according to Tita Jan, there is hope and that God gave these children to become our angels. Child with Autism (CWA) can be trained. Early intervention services greatly improve their condition. There are CWA who can be mainstreamed to regular schools, some can pursue college degrees and few are able to land on a job. For those who cannot make it to regular schools, they can still be trained to become functional at home. She cites as an example his 18-year old son Moneer who is non-verbal. He is a big help in their home for, with proper training, he can now do the laundry, cook breakfast, fix their beds and do gardening. Tita Jan closes her talk with a poem which she composed for his son. It is about the different things that she patiently did everyday in order for his child to win in life. As a mother of a 20-year old PWA, I can say that raising a child with autism is a long journey filled with challenges, struggles, frustrations and anxieties. On the other hand, Tita Jan is right in calling our CWA "angels". My son was sent to us by God to give direction to our life. Looking at him now, who had just finished his high school, I thank the Lord for the gift and the opportunity of raising him. He leads me to this path of becoming a chapter president of ASP Imus and to reach out to those families who are struggling with Autism. About the contributor. Maria Pamela Genil Turingan is a mother of adult boy with autism. She has earned her Master’s Degree in BS Architecture from University of Sto. Tomas last 1984. Mommy Pam was a full-time homemaker Vice President and Incorporator of Special Care for Special Needs Foundation, Inc., Imus, Cavite - a non-stock, non-profit organization engaged in the rehabilitation and special education of children with special needs. She is the current president of the Autism Society Philippines City of Imus, Cavite. I hope there will be another upcoming seminar like this. I'm glad to attend. Please let me know. Thank you.